Rather than piece together your bottom end with a variety of mismatched parts, order a BC stroker kit that not only increases your overall displacement for more horsepower and torque, but also delivers strength and reliability using only the highest quality parts. Lightweight crank available for 92mm only (7 lbs less). 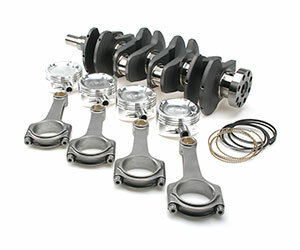 BC 4340 forged steel crankshaft (84.5mm, 92mm stroke) or 4340 BILLET steel crankshaft for 95mm stroke. BC 4340 ProH2K, Pro Series (ProH625+) or I Beam connecting rods featuring ARP premium fasteners.